* Connection : on double tab terminal for 4,8 x 0,8 mm clips. 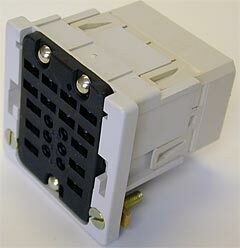 9243 socket is a rear wiring socket with clips for relay 1246 and relays of 2000 series. Complete indication regarding mounting and withdrawal are available in the technical support pages of this site. * complete coding accessory permitting 20 standard combinations by shutting 3 holes on the socket.